Fully customizable ARIS process models. The top-level diagram presents a high-level view of the YaSM processes. It is the main entry point into the YaSM process model. Overview diagrams show for each main process how it is related to the other processes and what sub-processes it contains. The top areas of the EPC diagrams illustrate the process interfaces in detail. Underneath the top area, the EPC diagrams contain one or several rows ("swim lanes") with a detailed account of the process activities. The process structure diagram shows the YaSM process structure on a single page. This diagram can be used for directly navigating to specific overview or EPC diagrams on the main or sub-process levels. The YaSM data object model provides a complete overview of the key relationships between the YaSM data objects (documents and templates). Its purpose is to facilitate an understanding of each object's relevance within the YaSM framework. Object lifecycle diagrams are available for every YaSM data object. Their aim is to illustrate which YaSM processes create, update, read and archive particular YaSM objects, and how their status changes throughout their lifecycle. If you would like to see full-size examples of these diagrams, please open the collection of screen shots from the YaSM Process Map for ARIS in PDF format. The RACI or responsibility matrix provides a summary of the YaSM roles' responsibilities in the various YaSM processes. Our YaSM RACI matrix comes in the form of an ARIS matrix model. This means the matrix is automatically updated when roles are added to or removed from the process diagrams. 95 checklists in Microsoft Word™ format explain the YaSM key terms in detail. Typically, a YaSM checklist exemplifies the structure of the data or information contained in a document or record. Example: The checklist for the incident record explains what information is typically maintained for service incidents. Checklists are available for every YaSM key term and are generic, i.e. applicable to most organizations. Many checklists can be used as templates during your YaSM initiative. For instance, the checklists for service agreements can serve as a starting point when you need to create such agreements for your organization. 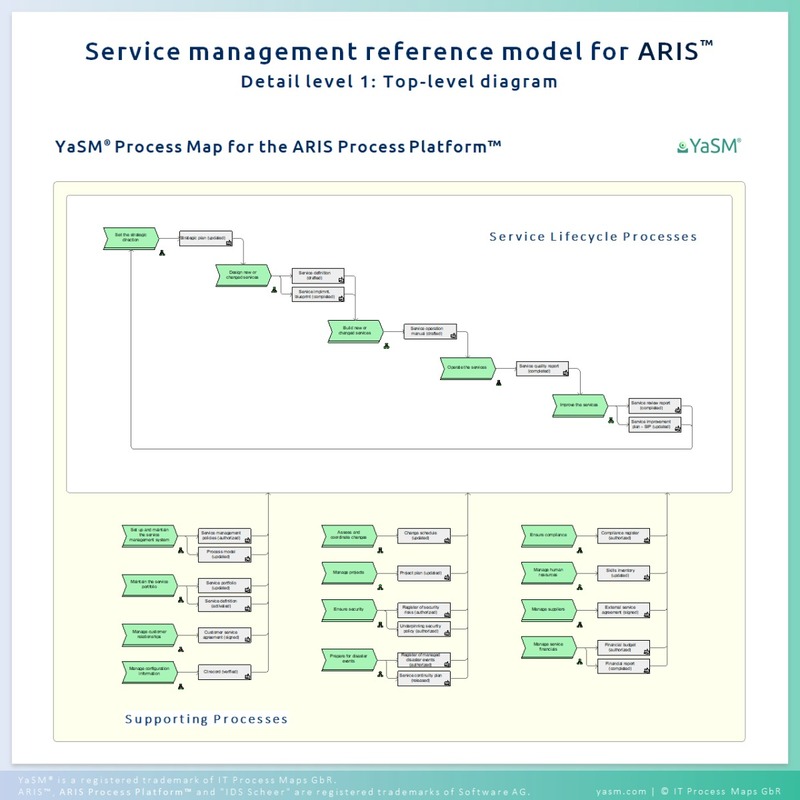 The YaSM Process Map for ARIS is specifically designed for the ARIS Process Platform™ by Software AG (formerly by IDS Scheer AG), making consistent use of ARIS features like object instances, attributes and hierarchically structured models, and an integrated RACI matrix. Coverage: All YaSM service lifecycle and supporting service management processes. Platform/ environment: ARIS Process Platform™ version 7.1 or higher (ARIS™ licenses are not included). Language versions: English or German. License model:	Licenses to use the product are granted on a simple per-site basis, where a site is defined as a single company location or a cluster of adjacent company locations within one geographic region of a country. There are no recurring license fees. Services and support: Product updates, help with general questions on YaSM and technical product support (these services are included in the purchasing price during the first year; support contracts are available to customers who wish continued support). See also the complete product specification and the full license conditions for the YaSM Process Map. Register for a YaSM webinar.